Birds Eye is making its way to Snapchat for its first sponsored lens campaign to mark Captain Birds Eye’s Golden Jubilee. Kicking off yesterday, the lens will turn users into Captain Birds Eye himself, while friends will be transformed into a fish finger. 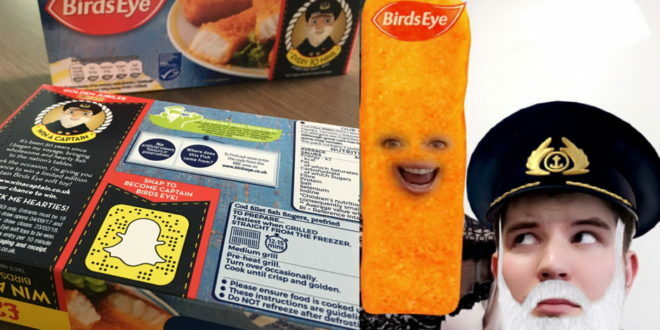 By using the new Snapcode, fans will be able to unlock the lens, which will also start appearing on 16 Birds Eye products including fish fingers, breaded and battered fish from September 4th. “I can’t think of a better way to celebrate the Captain’s Golden Jubilee than transforming yourself into him for a day – and turning your first mate into a fish finger,” said Colin Buckingham, digital marketing manager at Birds Eye. As part of the campaign, Snap Ads will also be running in celebration of the Golden Jubilee, which allows Snapchatters to swipe up and access the lens.